It's been a busy weekend for Discovery stuff. I've got new tyres and finished installing several lights. The tyres and revamping the wheels is for another article. With the installation of the new heavy duty bumper on my Discovery 2 I had the choice of driving lights or fog lights. The existing wiring is for fog lights in the bumper but I selected to connect neither of those. I have ignored the lamps that came with the bumper and purchased some Daytime Running Lamps. All new cars in the UK have had to have them for the last couple of years. I suspect this is the case throughout Europe. I am sure all drivers have noticed the bright LED rings and patterns at the front of new cars on the road. When I first saw them I thought they were just manufacturers decorative lights but I now know better. Apparently the EU believe that a lot of accidents would be prevented if all cars had them. I am dubious about the reliability of the statistics but as I have never found front fog lights to be of any use I would prefer to fit something that will get used. The kit I bought came with all the wires and a unit that cuts off the Daytime Running Lamps (DRL) when the main lights are turned on. 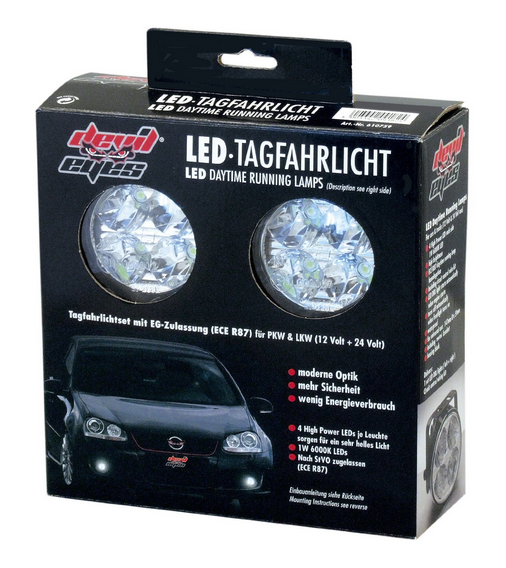 This is a requirement because DRLs are very bright to enable them to be seen during daylight but this makes them dazzling to other drivers at night. I originally planned to run all the wires as supplied but on further thinking I realised I could reuse the fog lamp wiring that would otherwise be redundant and which conveniently already ran to exactly where I was going to fit the new DRLs. After printing out the circuit diagram from the Land Rover RAVE manuals I made a few sketch modifications ending up with the above. This adds very little new wire and has a lot of re-use of the existing loom. 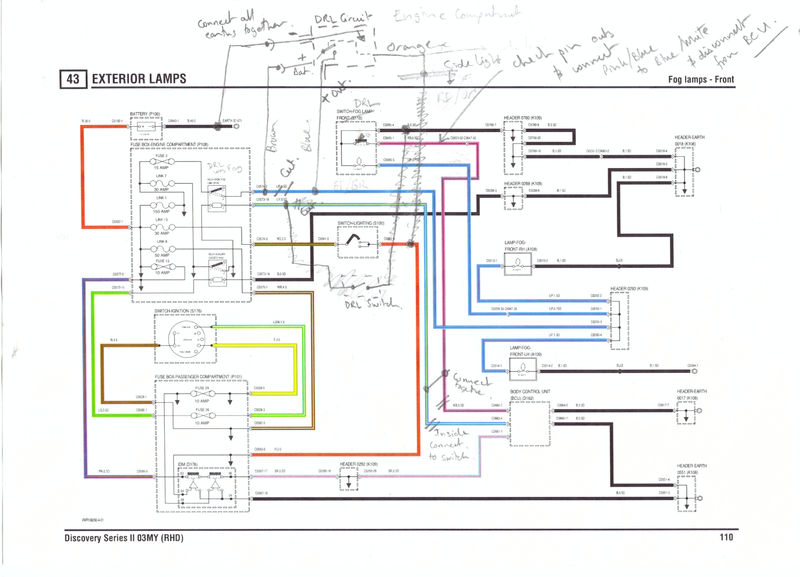 I worked out from that circuit and the header details from the RAVE manuals that I could even swap the fog lamp switch for a rear wiper switch to turn on and off the DRLs using the same switch connector and wiring. 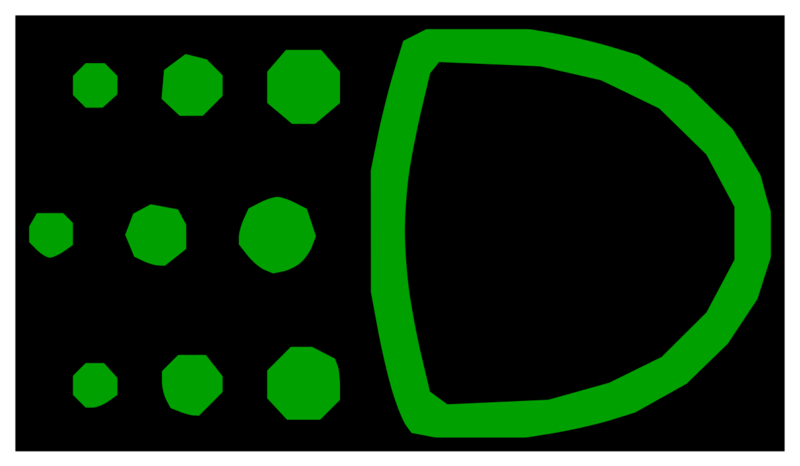 A switch for DRL is not required because they are on all the time and automatically go off when the side lights are on. I complicated the fitting by adding a switch for use when wading or fording. I would rather not have any powered items under water for long periods even though I am using waterproof connections. My version only requires cutting the output of the front fog lamp relay to power the DRL circuit attaching the DRL circuit orange trigger wire to the side light cable and hooking up a switch. 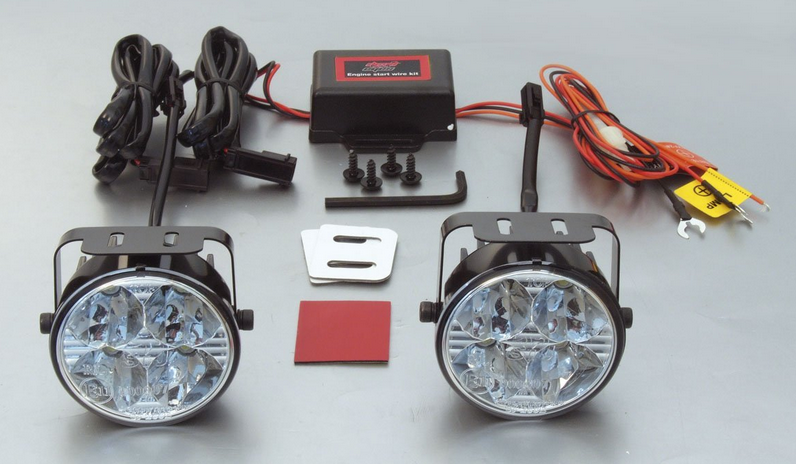 The lamps themselves are connected to the existing fog lamp leads with new waterproof Econoseal connectors. To keep the cables short I wanted to do all the connections near the fuse box. This requires lifting the fuse box to get under it. 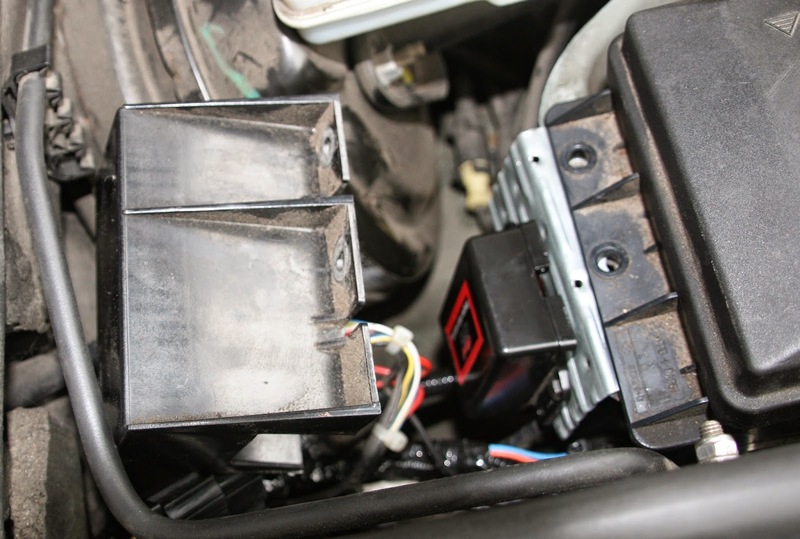 Before trying to remove the fuse box it is essential to disconnect the positive feed on the battery terminal. One of the fuse box bolts is right under the main positive cable connection and as I can testify trying to get a socket down there without disconnecting the battery results in nearly welding the socket to the head of the bolt! 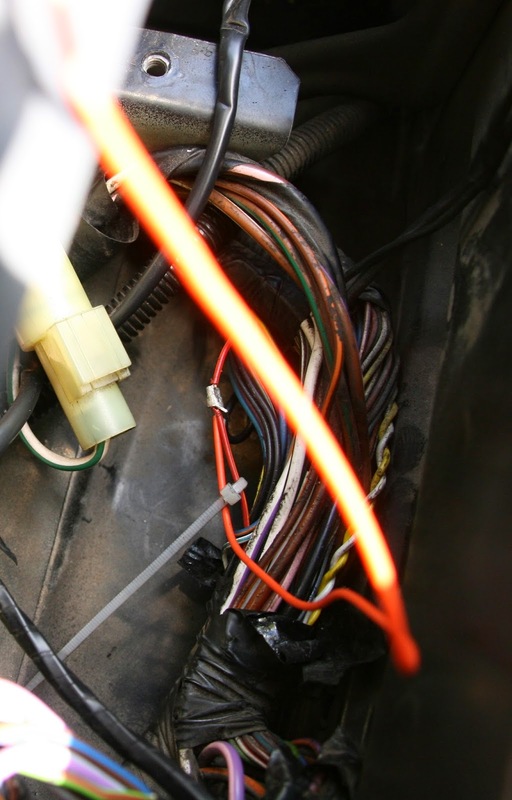 With the battery disconnected removing the fuse box is easy however there is little play on the cables which restricts access under the fuse box. I used a block of wood to wedge it up and disconnected some of the sockets to get just enough room to work. It was a bit tight but was possible. The red with orange stripe side light feed can be found fairly easily where a smaller bundle of cables emerges from the thick bunch. About an inch of unwrapped bundle was visible at the corner. I had to pull back a bit more of the tape to get enough slack to be able to join in the extra lead. I carefully cut back the insulation without cutting the wire and crimped on a joining cable. This is not normal practice because it is way too fiddly for all but us obsessive types. It would be just as good with a straight crimp joiner. The more time conscious could use a convenient but in my opinion horrid looking Scotchlok (TM) or snap lock connector! 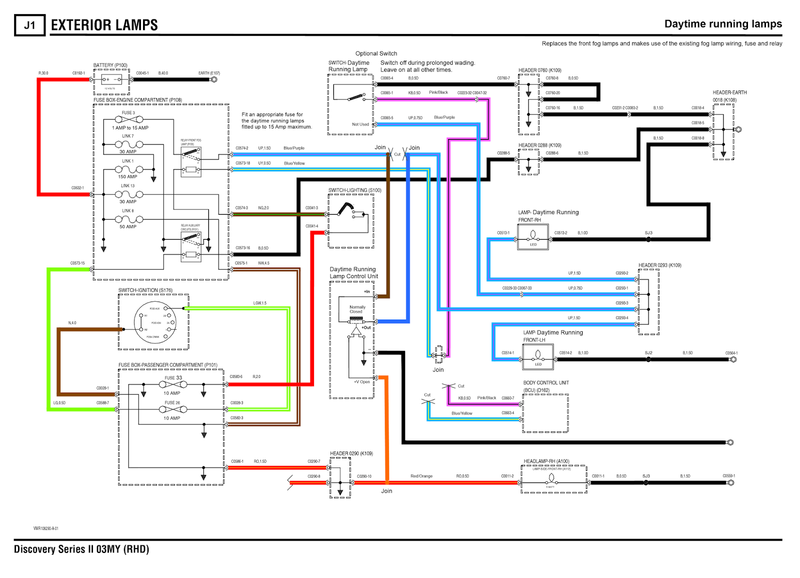 The rest of the job is fairly straight forward and identifying the cables is fairly easy if you use the connector diagrams from the Land Rover RAVE manuals or TOPIx. Remember to replace the front fog lamp fuse with something more appropriate. Most DRLs use LEDs so their power usage will be much lower than the factory fitted fog lamps. The circuit or relay and the wires that come with the DRL kit will have a lower rating. Just look at the fuse that comes with the DRL kit and fit a similar amperage rating fuse in place of the front fog lamp fuse. It does not have to be exactly the same as long as it is close but not a smaller rating. As a bit of fun and to document my car properly I have produced the DRL circuit diagram in the same style as the rest of the Land Rover RAVE circuits. This is not to be confused with the Daytime Running option included in the Body Control Unit (BCU) program. That BCU option is used in some jurisdictions to keep the headlights on all the time. It is not enabled on UK models. My version is specifically to enable me to re-use the fog lamp cabling for Daytime Running Lamps. Under the dash I just cut and joined two wires near to the Body Control Unit. This is on the near side of a UK Discovery. There are a lot of wires but if you know the colours and the connectors they come from, it is fairly easy as there is enough slack in the cables. I mounted the DRL circuit on a simple bent metal bracket next to the fuse box using the existing fuse box bolts. I spend a lot of time making the cables neat on any wiring I do. I can't bring myself to just connect it up. I have to wrap the wires and cable tie where necessary. I am pleased with the results. The lights worked first time. On when the ignition is fully on and off when the sidelights or headlights are on. The circuit that came with the DRL kit I used must include voltage detection because the lamps go out after a few seconds if the engine is not running. That's an added bonus to avoid the battery discharging unnecessarily. The spot lights I ordered arrived while I was doing the DRLs so I fitted the spot lights the same day.